The Loop Core Deluxe features new upgraded hardware that allows you to record loop phrases up to 8 hours with unlimited layers in 24-bit high-resolution audio quality into 99 saved memory banks. Playing guitar is always more fun with a drummer. When you don’t have one, use one of the Loop Core Deluxe’s 40 different realistic sounding drum rhythms. Different styles include rock, pop, blues, swing, and more. Don’t worry about loosing all your hard work. 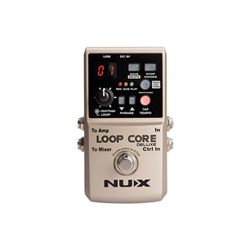 With a Mini-B USB connector, you can connect the Loop Core Deluxe to either a Mac or PC and import your loops as 24-bit 44.1kHz WAV files.